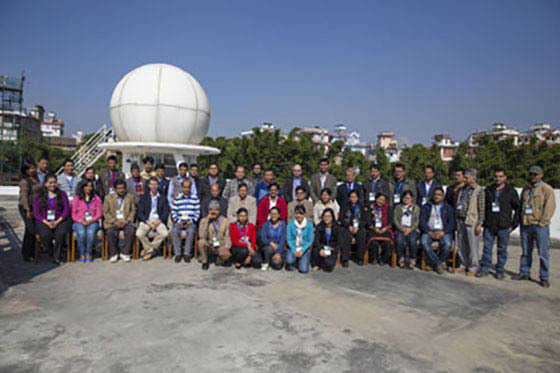 A three-day advanced training on remote sensing (RS) techniques ended on 7 November 2014. Participants learned about specific remote sensing techniques applicable to crop monitoring and drought early warning system. About 30 agricultural development practitioners from government and non-governmental agencies, including the Ministry of Agricultural Development, World Food Programme, Department of Irrigation, and the Department of Hydrology and Meteorology of Nepal attended the training. Birendra Bajracharya, MENRIS Regional Programme Manager, talked about the SERVIR initiative’s focus on using earth observation for agriculture-related applications. The training was organized by ICIMOD under the framework of SERVIR- Himalaya, a programme supported by the National Aeronautic and Space Administration (NASA) and the United States Agency for International Development (USAID) with an overarching goal to improve environmental management and resilience to climate change. The training is part of the collaborative effort between ICIMOD and the Ministry of Agricultural Development of Nepal to develop an operational agriculture monitoring system through conjunctive use of geospatial data, science and ground based information. As most of the participants were familiar with GIS and remote sensing, the training focused on specialized techniques related to crop monitoring and drought assessment. They learned how to interpret satellite images, calculate image indices, and map crop type using satellite data so as to help end users make evidence-based decisions. The training also included visualizing and interpreting time series data which can detect abnormalities in crop growths. Indira Kadel, Senior Divisional Meteorologist with the Department of Hydrology and Meteorology, said, “These satellite images will help me carry out weather analysis using GIS. These tools are equally useful for preparing agro-advisory.” Dibas Raj Bista from the Ministry of Agricultural Development said that he gained insight into how MODIS satellite images made available by NASA can be effectively used for agriculture monitoring. “It would be very fruitful if we could receive a follow-up training on this subject with intensive theoretical and practical components,” he said.